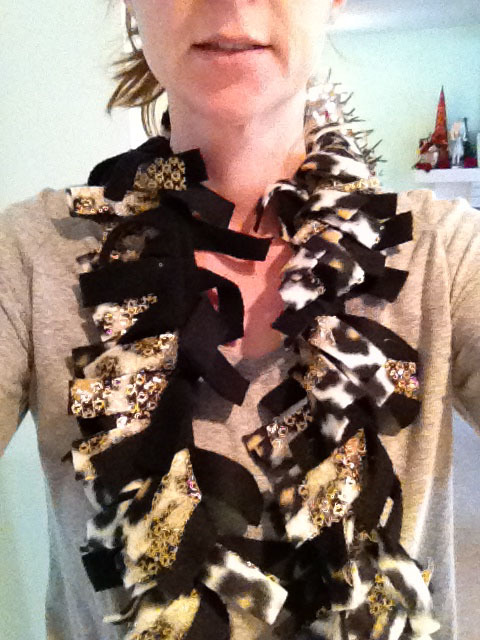 I first made these scarves for my fellow cheer moms to wear to cheer competitions. 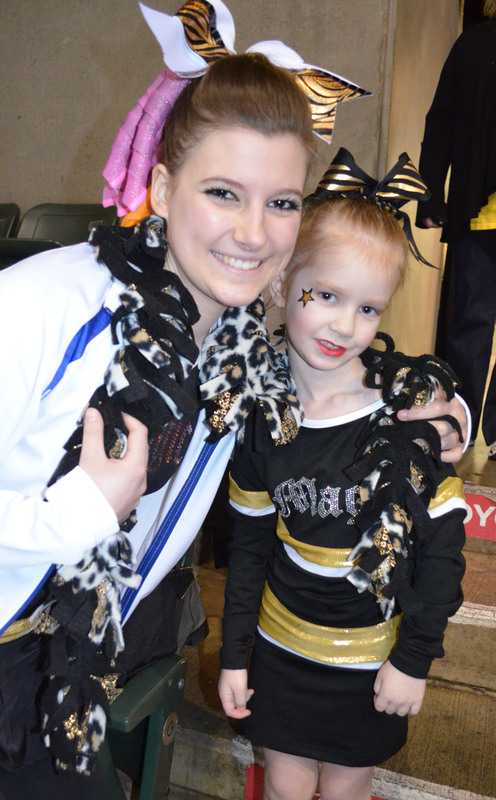 Here is Lulu giving one to her coach. We made them for Valentine’s Day too. And if you don’t already know how to make them, I am going to show you how. I had someone ask me to make her 8 of the cheerleading colored ones right before Christmas. 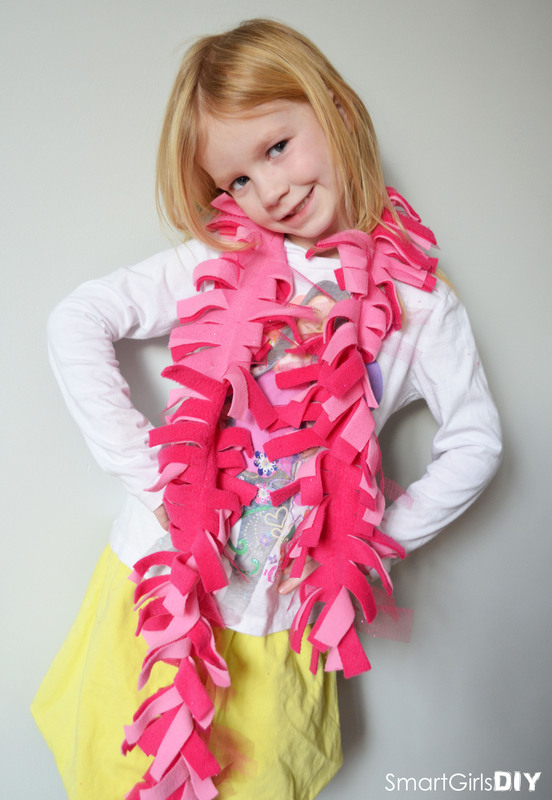 Once I had the sewing machine out Smart Jr and I decided to make a bunch more. My younger kids gave scarves to their teachers too. And we made one for my sister-in-law. I even pre-cut a crap load of fleece into 6 in. strips, so we’ll be already to mix and match colors next time we decide to make scarves. 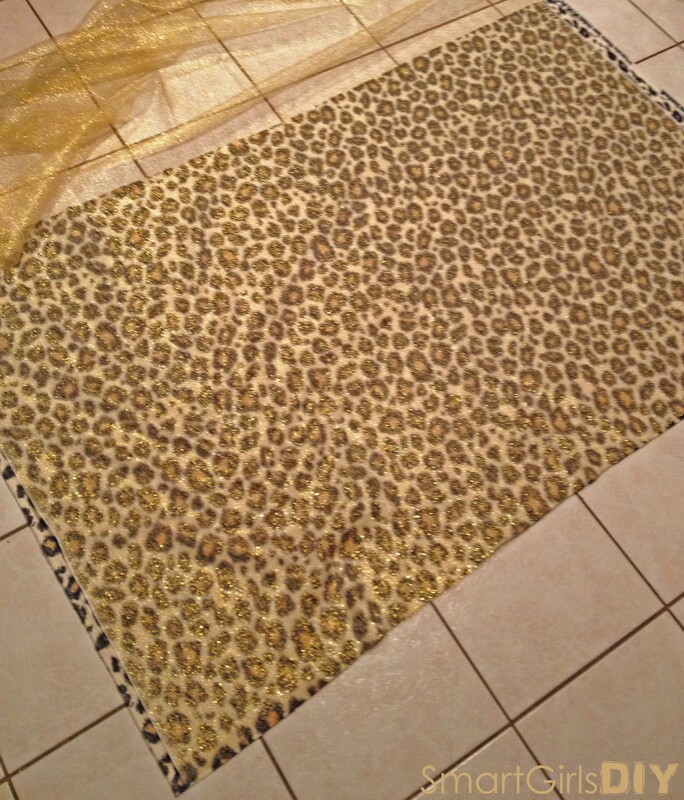 1) Lay out fabric (floor or table) and layer all 3 pieces on top of each other the same way they will be in the scarf. I always put the shiny material in the middle. 2) Mark out 6 inch strips. You totally DON’T have to draw the entire line, but this is the fool-proof method. 3) CUT. Again, I like to do all 3 pieces of fabric at once. That way it’s all ready to sew as soon as you cut the strips. 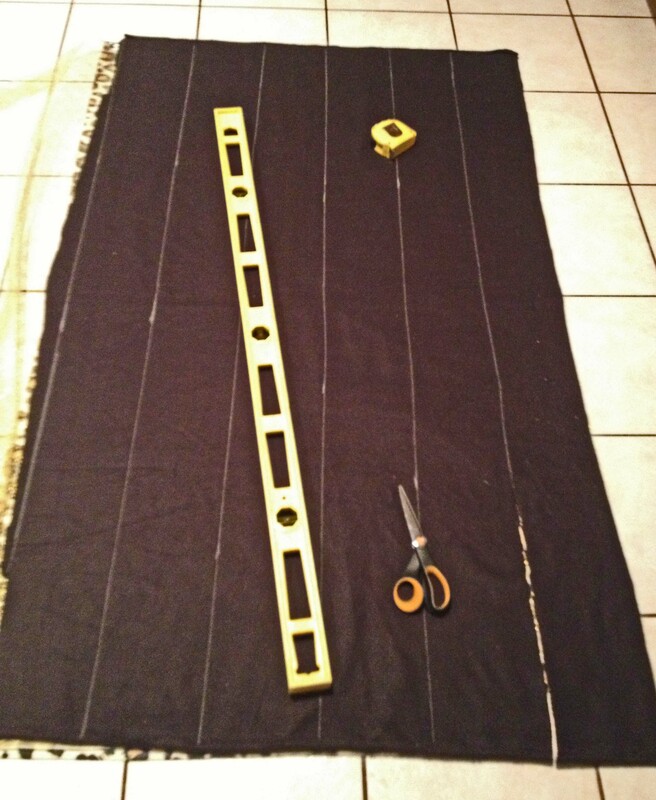 4) Sew two lines down the center of the strip. I sew one way, turn it around and go back. 5) Even up the ends by cutting off the excess, but be sure NOT to cut through the lines you just sewed. 6) Cut notches into the fabric no more than 1/2 inch apart. 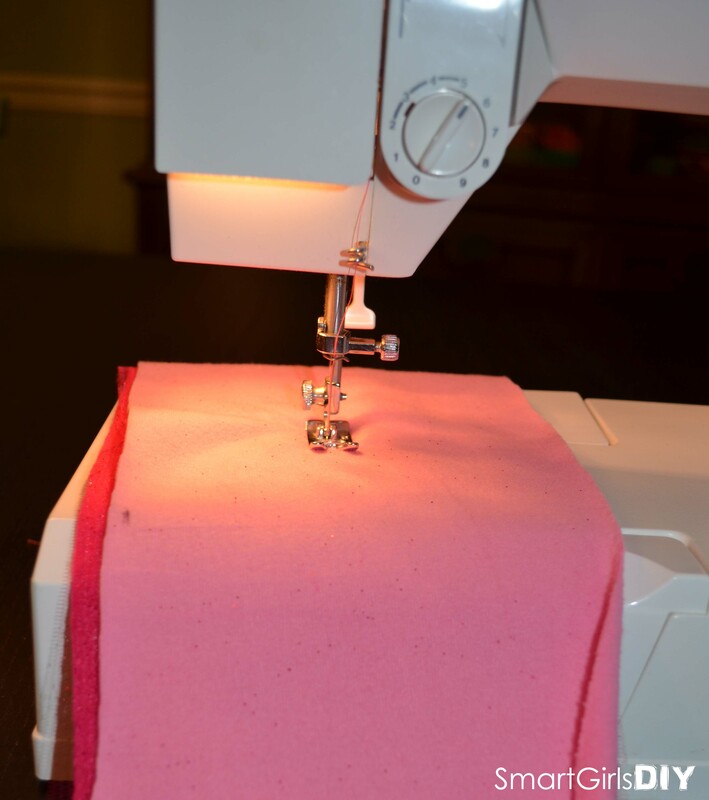 DO NOT cut all the way into the line you sewed, but don’t be afraid to get pretty close. If you’ve ever seen a lame looking DIY fleece scarf that lays flat and doesn’t get all twirly, it’s because they didn’t cut the notches deep enough. Their notches are probably also too. Don’t worry, it’s so easy even a husband can help! 7) WASH and DRY. I always do this before I give them as a gift. It fluffs up the fleece, softens the shiny fabric, and makes the whole thing look more twisty, which is how they’re supposed to look. And there you have it. 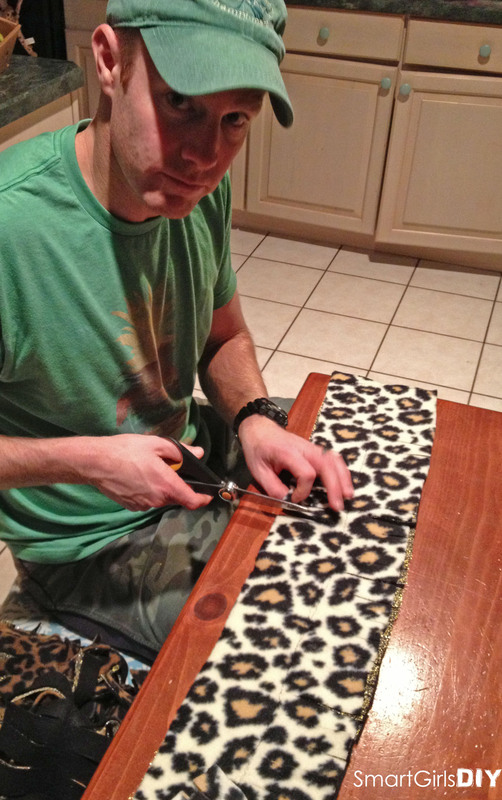 I made 12 of the cheetah print scarves in one night. 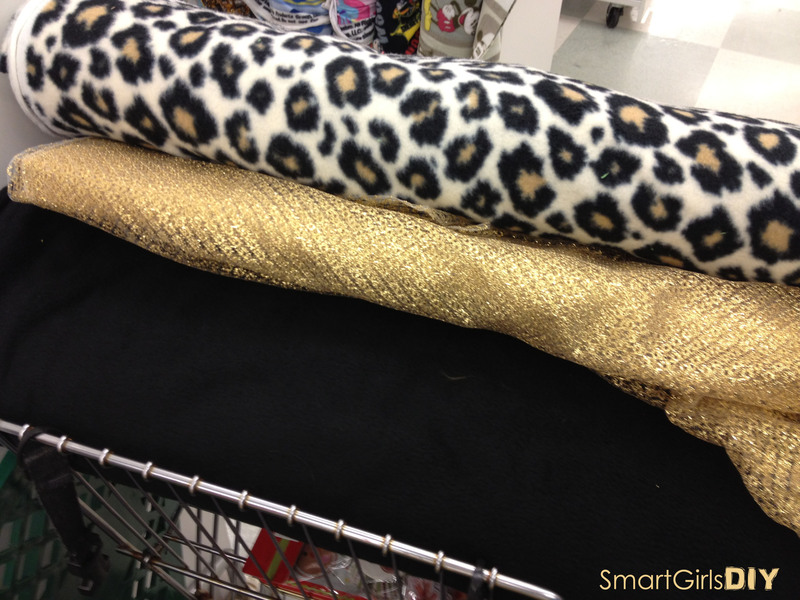 Half were with white cheetah print and the other half with the brown, but they all had black fleece and gold shiny material in the middle. 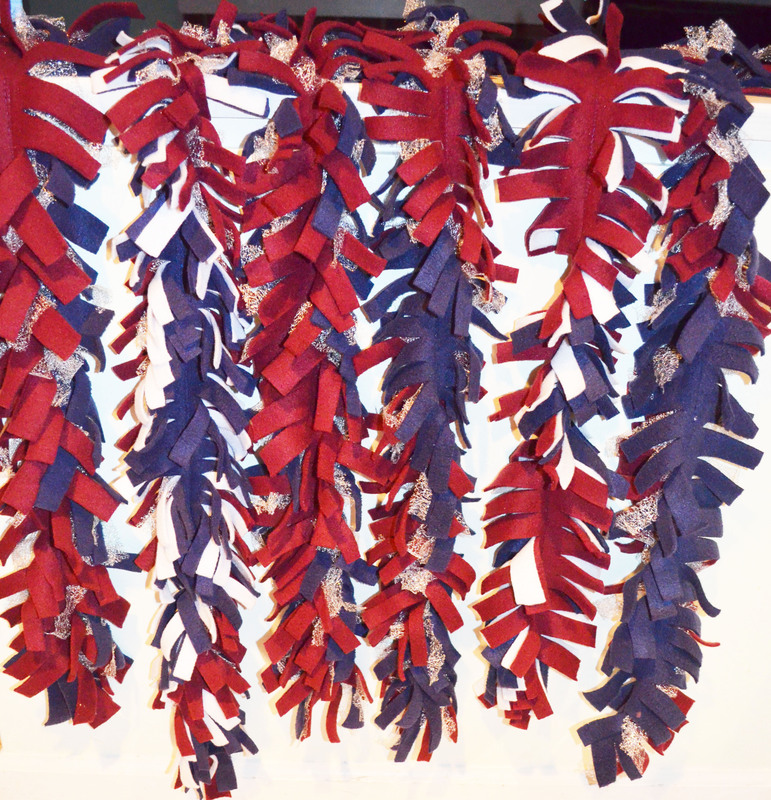 The next day we made eight of the school colors and 3 other random scarves. Smart Jr tried a little of the sewing, but the machine was acting up, so she mostly just cut. There were 3 versions of the school ones. Most had 1 maroon, 1 blue, and 1 shiny silver piece. Some had 1 maroon, 1 blue, 1 white fleece. One even had maroon, blue, white fleece AND the shiny silver. I see that the scarves are 6″ wide, but how long are they? Depends on how wide your fabric is. 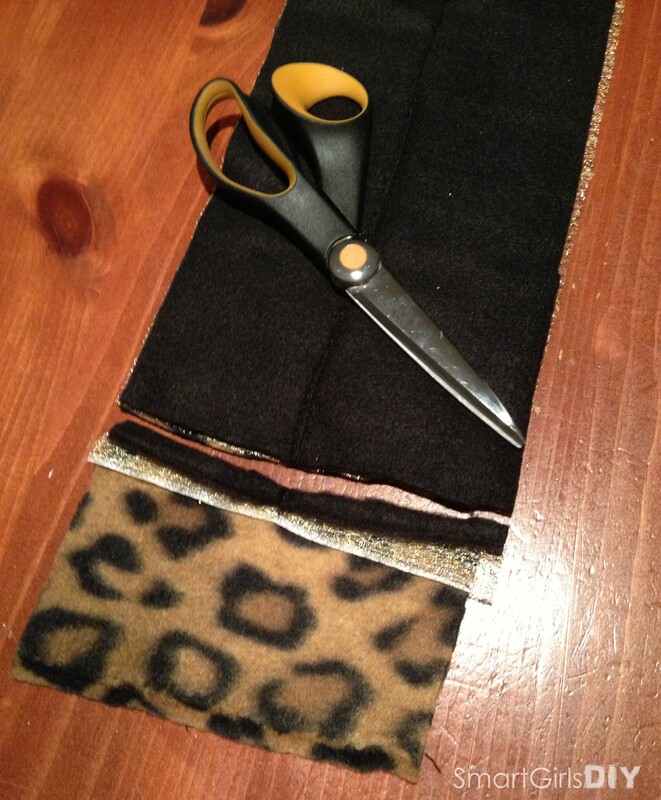 My fleece strips were 59 inches because that was the width of the fleece fabric. But my shiny fabric was only 54 inches, so sometimes I trimmed to fleece down to 54 as well. Anywhere in that range is good for an adult. They seem shorter after the material is cut and twirls up a bit. I know this is an older post, but i just found it. 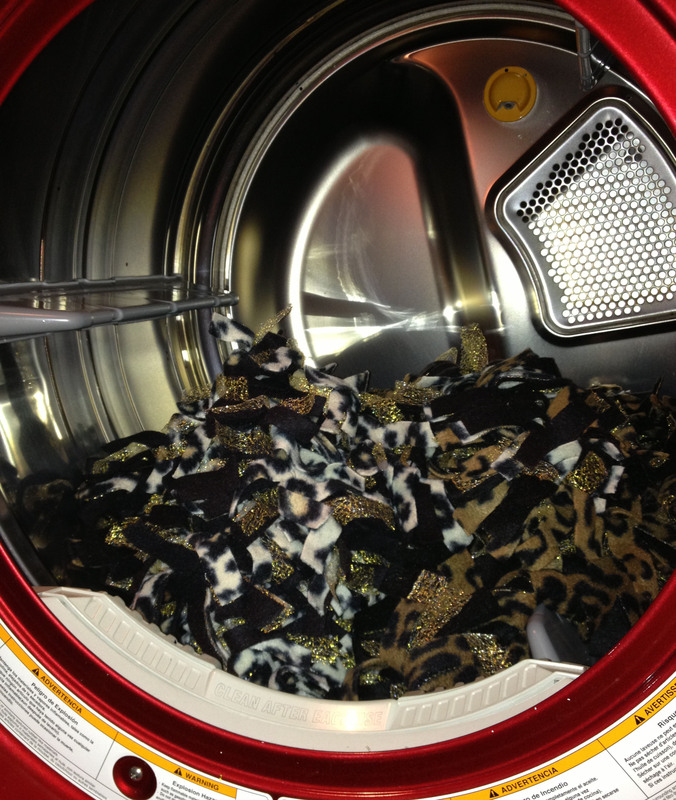 What kind of fabric is the “shiny material?” Its not fleece, right? Hi Kimberly. No it’s not fleece, it’s a sheer material. 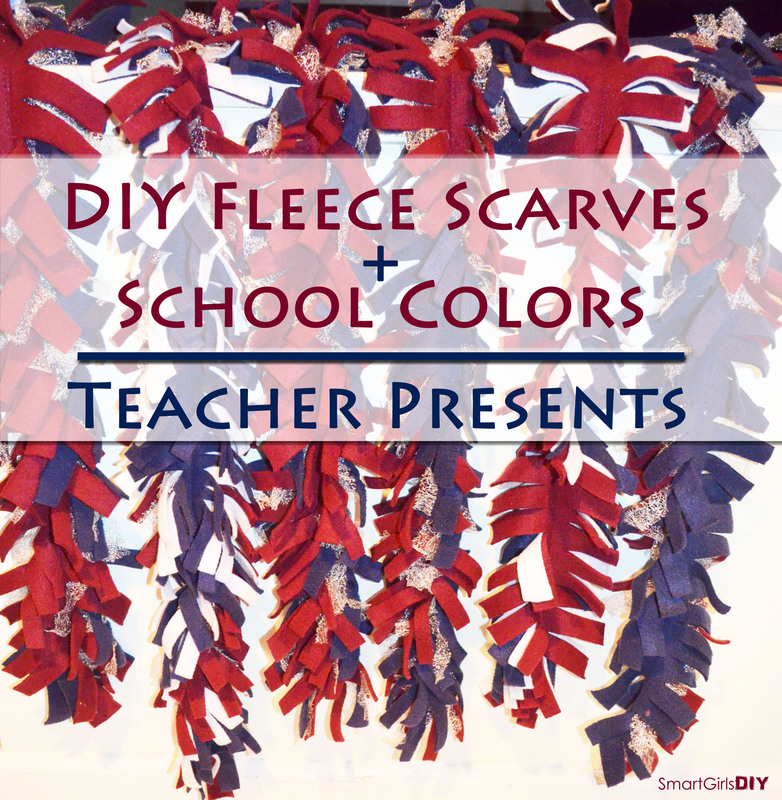 You can use 3 pieces of fleece or you can sandwich sheer material between two pieces of fleece. I like the latter better because it makes the scarf less bulky, but I’ve made them both ways. Thanks for asking. Great ideas! How many did you make ? And how much fabric ?